Family, Vervain. Color, violet blue. Calyx, 5-toothed, one tooth being shorter than the others. Corolla, tubular, with spreading border, 5-cleft. Flowers, in spikes, sessile, small, narrow, on erect, 4-sided stems, 3 to 7 feet high. Leaves, petioled, oblong to lance-shape, sharply pointed at apex, the lower often lobed or halberd-shaped, serrate with sharp teeth. June to September. In low grounds, borders of swamps, moist fields and meadows in all the Eastern States and westward to New Mexico. The vivid blue of this tall plant makes it a conspicuous fall flower. It would be pretty were the flowers all to blossom at once; but buds above, seeds below, a small circle of bloom between is its parsimonious habit. V. angustifblia. - Color, purple or blue. A low plant with slender stem, 1 to 2 feet high. Leaves, linear or lance-shape, tapering into short petioles, serrate. Spikes of flowers crowded, single, terminating the branches. Fruits quickly follow the flowers, overlapping one another. July and August. Color, purplish. 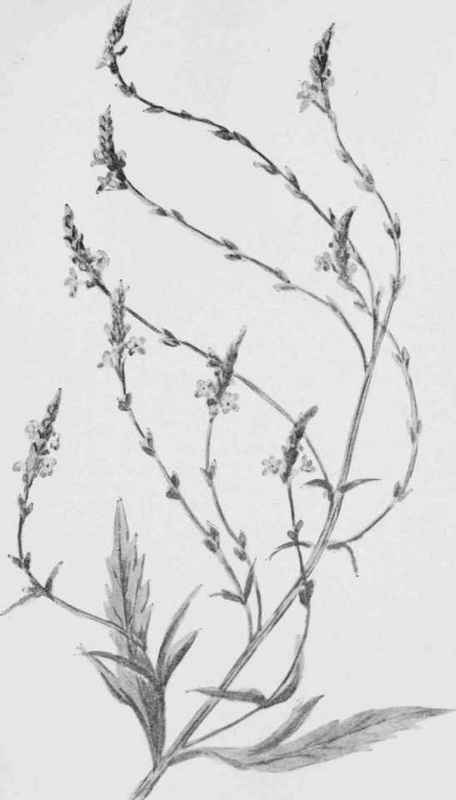 Flowers, small, with the 2-lipped corolla in long, thread-like spikes which at first are short, but grow to 4 or 5 inches in length. Leaves, the upper long, narrow, acute, sessile, entire; lower pinnately cleft into 3 lobes, which are much cut and toothed, with margined petioles. Stem, square, 1 to 3 feet high, much branched. June to September. Often a weed in cultivated grounds; found also in old waste fields and along roadsides, from Maine to Florida, more common in the Middle States.